Twenty-six weeks. Twenty-six DING DANG weeks, y'all. That's how long it took us to overhaul our basement (we were only able to work on it on the weekends and a bit in the afternoons). But guys, it was worth every single dusty second of renovation. Let me begin by telling you that a basement was a "must" for us when we were house hunting. We really wanted a place to entertain and watch movies apart from our family room. When we found Project Stoneywood - it had many of our "must haves" ...including a basement. Our basement is not very large... In fact, it's only one room that's roughly 12ft by 22ft. Our garage makes up the remainder of the footprint of the house. Since the basement sits directly off the garage, it serves as Hub's and my main entry and exit point. That seemed like a tall order for 264 square feet, but somehow we managed to make it all work - taking advantage of every square inch. Hubs' main requests? 1) A large television. 2) Some America themed decor. 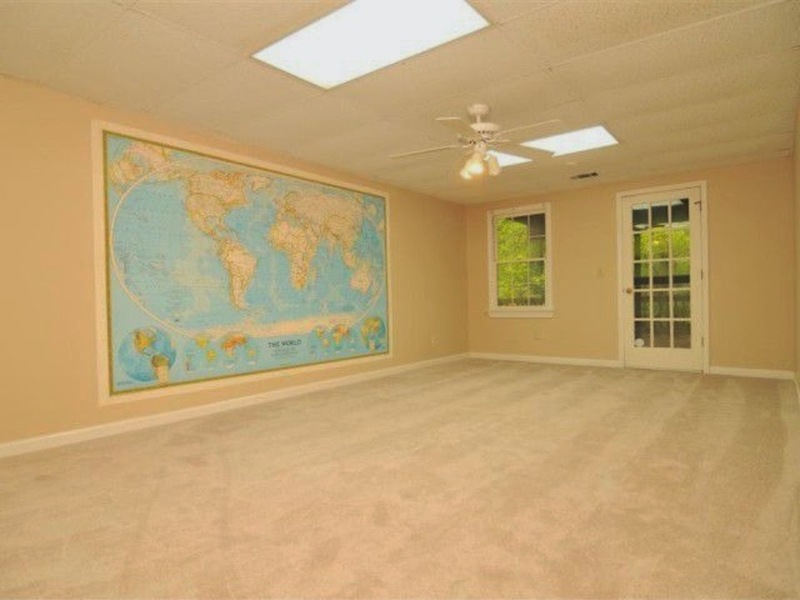 When we first bought the house, the basement was basically a ugly, beige rectangle with bad flourescent lighting, a drop ceiling (think dingy office space), and a GIANT outdated map. I will say the map was fun - and we debated keeping it, but ultimately decided it needed to go. The seller installed new flooring to replace this carpet just before we moved in.... SCORE. 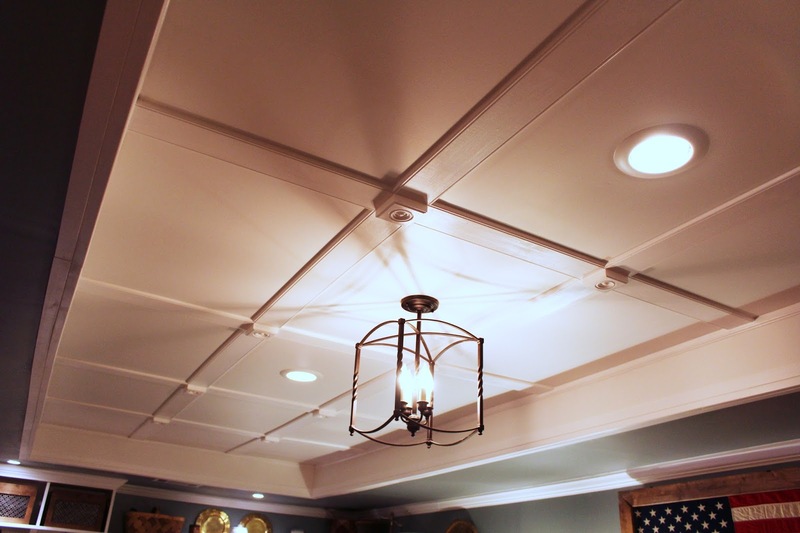 When we were prioritizing projects in the basement, we both agreed the ceiling and lighting situation had to be remedied sooner than later. The ceiling only 8 feet high - and the tiles looked dirty. It wasn't a good look, y'all. 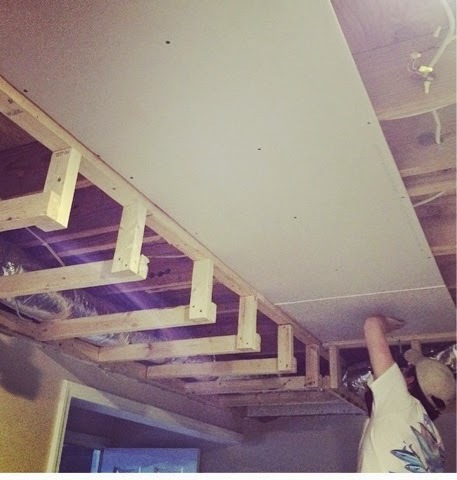 Hubs made quick work ripping out the old ceiling. 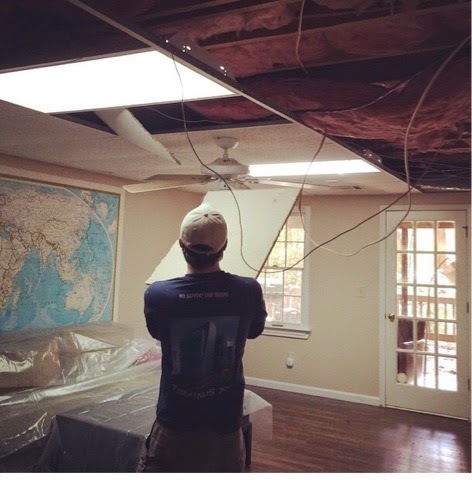 He then moved the mechanical works (duct work and electrical) around to the perimeter of the room so that we could create a tray ceiling. Doing this gave us an additional foot of height in the center of the tray. 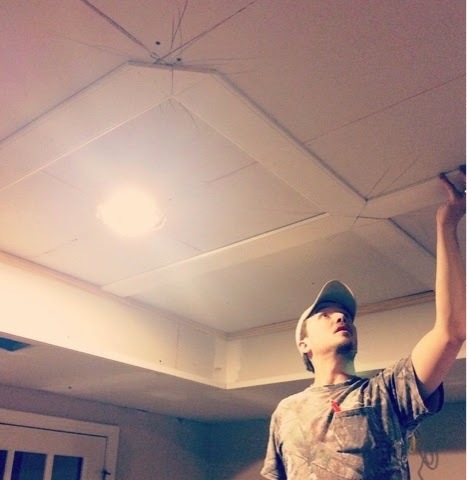 He wired up new can lights and a pendant - YAY for no more ugly office lighting!! 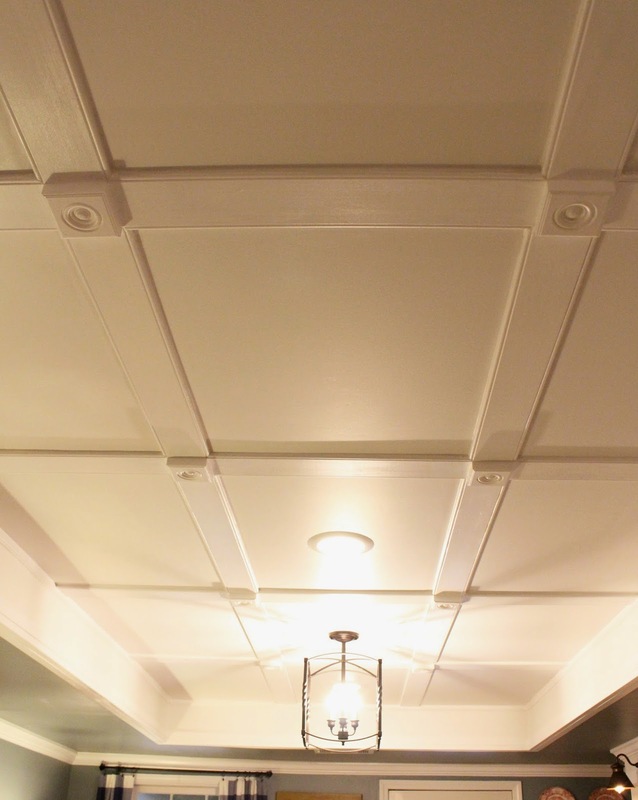 Can we just talk about all that beautiful trim work? 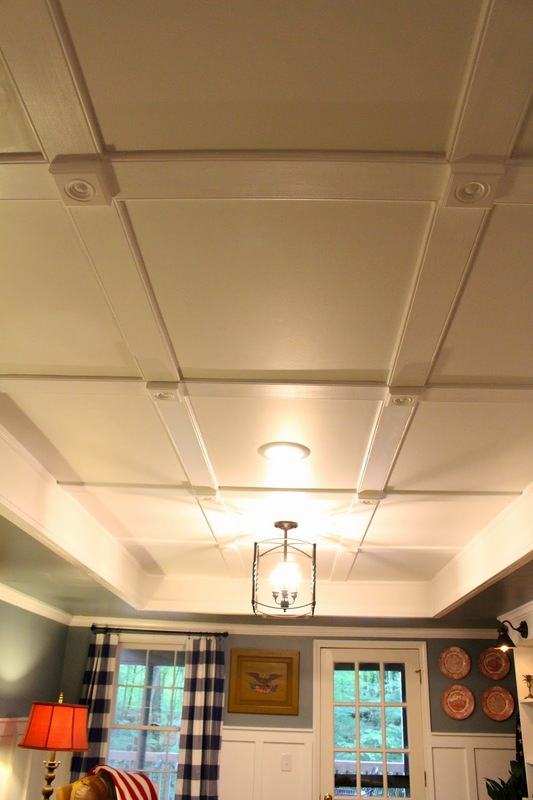 I have always loved a coffered ceiling. We opted to do a low profile version to jazz the place up a little bit. The final product is just perfect. Is it weird to love a ceiling THIS much?! All of the lights are now on dimmer switches - HUZZAH! 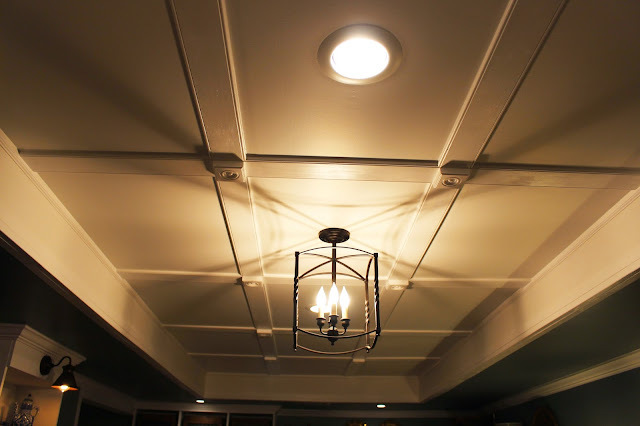 The carriage house pendant was a major score from the Ballard Outlet. I really, really love that place for lighting. It never fails me. The inset of the tray really makes the room seem so much bigger. I'm so happy we decided to go ahead and raise it. Okay - I hope I didn't bore you to death with a post dedicated ENTIRELY to our ceiling. I can't wait to share our entertainment builtin with you next! Happy Tuesday, friends! Talk soon! I wish I had an ounce of the handiness the two of you have. 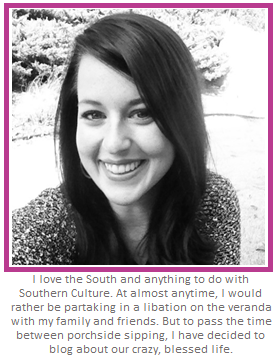 So impressive post, really nice reading about brandi nell the Southern Belle, this view website is good too. 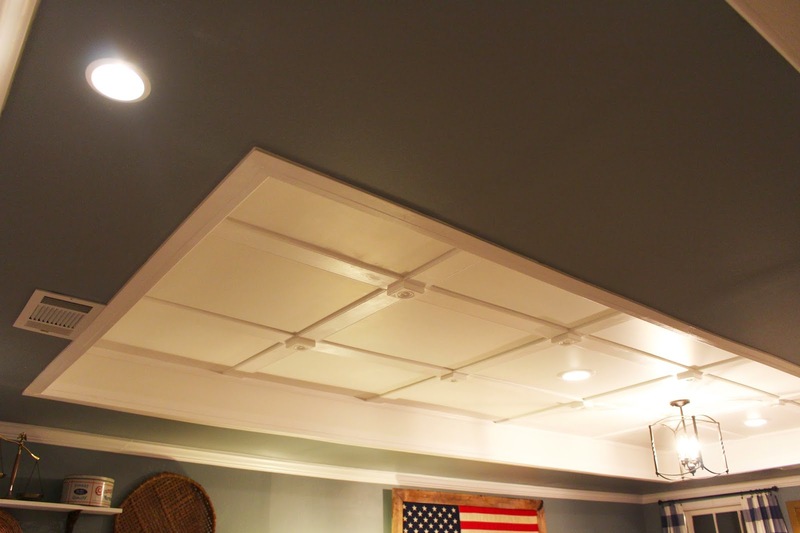 The patriotic basement post is really good and impressive, hope you share more about it soon.